The FRAXA Drug Validation Initiative (FRAXA-DVI) provides speedy, cost-effective, objective testing of potential new Fragile X treatments. FRAXA has funded FRAXA-DVI every year since 2011 for at least $50,000 per year. The FRAXA Drug Validation Initiative (FRAXA-DVI) provides speedy, cost-effective, objective testing of potential new Fragile X treatments. Pharmaceutical companies developing medicines for brain disorders like Alzheimers, epilepsy, or depression sometimes find evidence suggesting that their compounds could treat Fragile X. They often contact FRAXA Research Foundation to discuss next steps. We can arrange to send promising compounds to FRAXA-DVI for further study. It is also a next step for testing new leads from university-based research projects. Since 2011, Patricia Cogram, PhD, and Dr. Robert M. J. Deacon, PhD, of the University of Oxford have worked at the University of Chile with animal models to validate new pharmaceutical leads for the treatment of Fragile X. Dr. Cogram maintains colonies of Fragile X mice and fruit flies, conducts standardized tests on lead therapeutic compounds, and compares their effects in the animals to previously tested drugs. FRAXA-DVI offers a rapid and cost-effective alternative to in-house studies. FRAXA-DVI’s cutting-edge technology with high-content screening and multiplexed animal models are oriented to fast screening of compounds with high reproducibility for de-risking, and acceleration of drug development in Fragile X syndrome. To expand their platforms, FRAXA-DVI works in collaboration with Sarah Lippe, Montreal, Canada (EEG); Peter Vanderklish, Scripps Institute, USA (OMICs) and Julie Lauterborn, UCI, USA (electrophysiology). 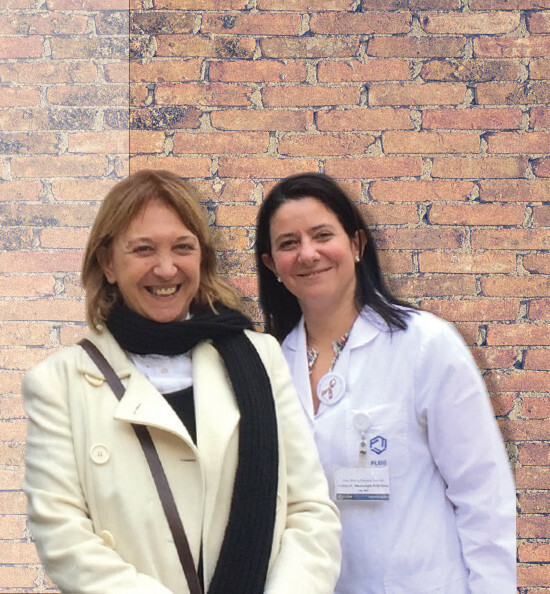 FRAXA-DVI works with Dr. Paulina Carulo (MD) from the FLENI Institute, Argentina, in the search for clinical biomarkers and candidate compounds in pilot clinical trials in Fragile X.
FRAXA-DVI allows us to partner with pharmaceutical companies to test their compounds in Fragile X. It has generated new leads and has already led to clinical trials in Fragile X. For more information please contact Michael Tranfaglia, MD, FRAXA Medical Director.